Judge Jeanine Pirro is the former District Attorney for Westchester County, NY, and a frequent guest on LKL. Her commentary is an LKL Web Exclusive. It's no surprise that Manhattan State Supreme Court Justice Charles Solomon refused a defense request to dismiss criminal charges against Robert Halderman in the David Letterman extortion case. As such, the case is scheduled for trial. Of course, the defendant can plead guilty and eliminate the need for a trial, but will he? Probably not. It appears that the defendant's attorney, Gerald Shargel, is primed to get Letterman on the stand and rake him over the coals. Why? Because he can! But let me digress for a moment. Defense attorneys make mountains out of molehills. They create smokescreens so thick they could convince a jury that the courthouse is on fire. In truth, their job is to take the focus off the defendant's actions, and to make the jury believe that the victim is the wrongdoer. If you're the victim of a crime, you're fair game – an open book. Indeed, a defense strategy succeeds when the jury stops wondering if the defendant is bad and starts wondering if the victim is bad. In some cases you almost expect the jury foreman to stand up and say, "We the jury find the VICTIM guilty!" Of course Halderman, is presumed innocent in a court of law, but we need to start telling the truth about the presumption of innocence. The phrase "innocent until proven guilty" does not mean that those who have examined all the evidence before trial must stick their heads in the sand and draw no conclusion whatsoever. Prosecutors don't drag people into court because they assume they're innocent – they indict people because they believe they're guilty. When the grand jury voted to indict Robert Halderman it didn't assume he was innocent. Its vote meant there was probable cause based on extremely damning evidence to assume he was guilty. Back to Letterman. So if Halderman refuses to plead guilty as charged and even refuses a plea bargain – assuming one is offered – Letterman must take the stand to establish the elements of attempted grand larceny in the first degree. Specifically, the prosecution needs to prove to the jury's satisfaction beyond a reasonable doubt that Letterman felt that he would be subject to "hatred, contempt or ridicule." (New York Penal Law section 155.05(2)). But in order to establish that, Letterman must testify. And when he does, it will be a circus. We will "ooh" and "ahh" over every sordid detail. How many in a day? Who changed the sheets? Was there ever a quid pro quo? The Sixth Amendment right of confrontation gives the defendant the right to confront his accuser. The trial judge, upon the prosecution's objections, will decide how far he can go in his cross-examination. In addition to Letterman's testimony, there is evidence not only of a picture, and meetings, but tape recordings of the extortion attempt itself, and a letter wherein Halderman threatens Letterman that his "world is about to collapse." Letterman may face a few more difficult months if Halderman insists on a trial. It's not easy to have the world discuss the most intimate and embarrassing details of one's private life. It may be cathartic for Halderman and his lawyer to go through this exercise, but in the end there's only one man whose world will collapse. 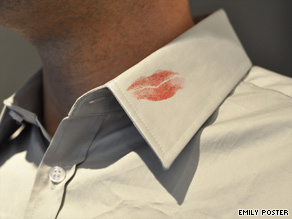 (The Frisky) So, let's talk infidelity. Many ladies want to know why it is men cheat. And here's what you want to hear, straight from the talk-hole of the testosterone enabled: men cheat because we are faithless, miserable dogs. We are backstabbing, silver tongued two-faces who stalk any smooth pair of getaway sticks in a short black cocktail dress that happens to saunter into our lusty field of vision. Men are horny wolves in fluffy sheep's clothing who delight in looking into your eyes and lying. Breaking hearts is our middle name. Why, at any given moment, while you're gabbing to your girlfriends about flowers purchased, omelettes made, sweet words whispered, we're picturing the nearest woman under the age of 25 in a sheer bikini, riding a mechanical bull. We are just hopelessly addicted to that "new car smell." We love to make you miserable in our pursuit of total hotness, your fickle happiness not our concern. And that's just part of it. If you want to blame someone for our cheating ways, blame evolution! We are hardwired to hunt, and to share our wicked cool genetic code with a world that demands that we do! The universe conspires to compel us to pursue that which retreats. See, we cheat because we're cavemen, and our half-gorilla brains demand we spread as much of our seed over as much fertile ground as possible to make sure that our little caveboys have the chance to grow up and do likewise. And we do this quickly, mind you, because you never know when a woolly mammoth will shish kabob us on one of their mighty tusks. It's not our fault. It's biology, genetics, science! How can you question science? Without it, the curling iron would never have been invented!